Fortinet FortiAP-14C Base HW FortiAP. We have access to multiple warehouse all over U. Faster order fulfillment while you pay less. The FortiAP-14C is a low cost 1x1 MIMO access point with integrated 5 port 10/100 switch in small desktop form factor. This device enables home office connectivity to the corporate network. Once plugged in, the AP automatically discovers the FortiGate wireless controller over the Internet, download its configuration and offers the same SSID used in corporate environments. This enables remote employees to gain secure encrypted network access to enterprise resources over the Internet. This feature also allows IT administrators to save time and reduce helpdesk calls by eliminating the need to assist remote users to resolve access issues. Protects your network with the widest range of security and networking technologies seamlessly integrated into a single device: Firewall, IPS, Application Control, VPN, Web Filtering, and many others. Going above and beyond Wireless Multimedia Extensions (WME) by offering layer 7 traffic shaping and application use control. Industry's most comprehensive monitoring, detection and suppression of rogue APs for PCI DSS compliance. Single Pane of Glass' Management Console. Unmatched visibility and control of all wired and wireless network traffic that eliminates blindspots in your security infrastructure and ensures consistent and effective policy enforcement and compliance. Allows simple and secure teleworker connection for wireless and wired devices alleviating the need for host VPN agents and complex configuration. High Performance Secure Thin Access Points. Leverage existing FortiGate or FortiWiFi platforms as controllers for low TCO. Full range of authentications and access for all use cases. Integration with FortiManager and FortiAnalyzer for unified control and reporting. Fast Roaming for uninterrupted data access. Automatic Radio Resource Provisioning (ARRP) for optimized throughput. Flexible deployment options with simple per device pricing. Layer 7 application QoS for maximum business productivity. Rogue AP control for PCI DSS compliance. The Need for a Fortified Wireless LAN. Enterprises are looking to increase productivity through uninterrupted access to applications and resources, without compromising security and agility. You want to increase visibility and control of your wireless network traffic by enforcing the same policies as your wired network and eliminate potential blind spots. You also need a solution that helps you meet compliance by proactively blocking unauthorized access all while providing tools for business continuity by following industry best practices. Integrated Wireless Security and Access Solution. Fortinet's FortiAP wireless thin access points deliver secure, identity-driven WiFi client access that creates a fortified WLAN network. Centrally managed by a FortiGate® or FortiWiFi platform with its integrated Wireless Controller, FortiAPs allow you to deploy a comprehensive, integrated security solution for your wireless and wired networks. By acting as a Wireless Controller, FortiGate or FortiWiFi security platforms enable you to deploy the comprehensive protection of the industry leader in enterprise unified threat management (UTM) in overlay architecture, thus leveraging your current investment. 2 dBi for 2.4 GHz. 2.5 dBi for 2.4 GHz. 2 dBi for 2.4 GHz, 3 dBi for 5 GHz. 3 dBi for 2.4 GHz, 4 dBi for 5 GHz. 2.4002.4835, 5.1505.250, 5.2505.350, 5.4705.725, 5.7255.850. 2.4 GHz b/g/n, 5 GHz a/n. 1x1 MIMO 1 spatial stream. 2x2 MIMO 2 spatial stream. 2x GE RJ45 ports (1x WAN port, 1x LAN port). 5x FE RJ45 ports (1x WAN port, 4x LAN ports). 2x FE RJ45 ports (1x WAN port, 1x LAN port). 1x GE RJ45 WAN port, 4x FE RJ45 LAN ports. 10x FE RJ45 ports (2x WAN ports, 8x LAN ports). 1x Type A, 1x Mini-B. 2x Type A, 1x Type B. Yes (4 priority queues for voice, video, data and background traffic). We specialize in firewalls, enterprise routers, servers, and enterprise type IT solutions. We offer the best products from top manufacturers in the Information Technology business such as Dell, SonicWALL, Fortinet, WatchGuard, NETGEAR, Cisco, Check Point, QNAP, Ubiquiti and many more to come. There are many reasons to shop with us but here are the main reasons why. If you are spending thousands of dollars and looking for great deals on quality products, we got you covered. We are a true U. Data security is one of our strengths. We use the latest encryption technology to ensure your information remains secured and we will not send your information elsewhere. We partnered with over 20 authorized distributors in the U. S to provide you the best price anywhere and the flexibility to meet your budget. Vendor promos, volume discounts, and promotional sales will be passed on to you so expect quality from us without overspending. 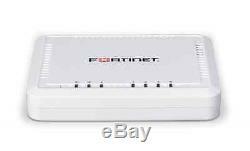 The item "NEW FORTINET FORTIAP-14C WIRELESS ACCESS POINT BASE FAP-14C-A" is in sale since Saturday, August 17, 2013. This item is in the category "Computers/Tablets & Networking\Home Networking & Connectivity\Wireless Access Points". The seller is "mcsd-at-home" and is located in Chino Hills, California. This item can be shipped to United States, to Canada, to United Kingdom, DK, RO, SK, BG, CZ, FI, HU, LV, LT, MT, EE, to Australia, GR, PT, CY, SI, to Japan, to China, SE, KR, ID, to Taiwan, ZA, TH, to Belgium, to France, to Hong Kong, to Ireland, to Netherlands, PL, to Spain, to Italy, to Germany, to Austria, RU, IL, to Mexico, to New Zealand, PH, SG, to Switzerland, NO, HR, TR, BR, CL, CO.